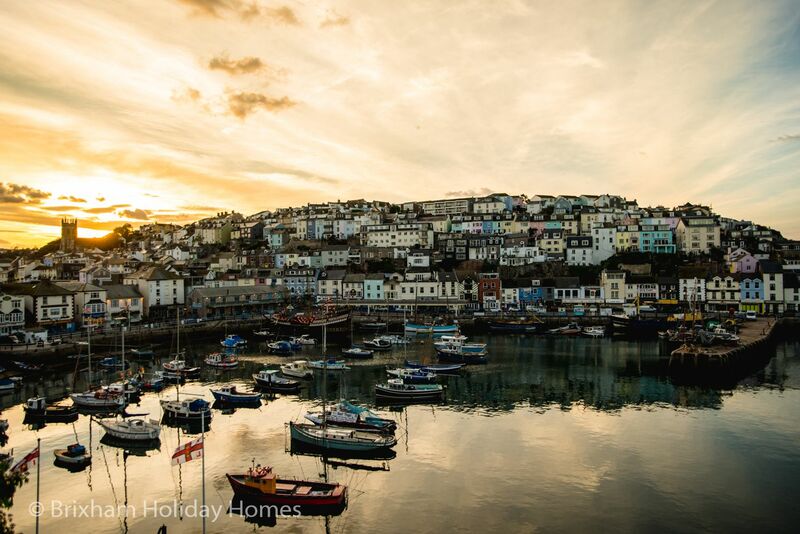 Coral is a super luxury, modern, ground floor self-catering holiday apartment in Brixham. This spacious modern 2 bed, 2 bath apartment lies on the ground floor of an immaculately restored Grade II listed Georgian Villa. 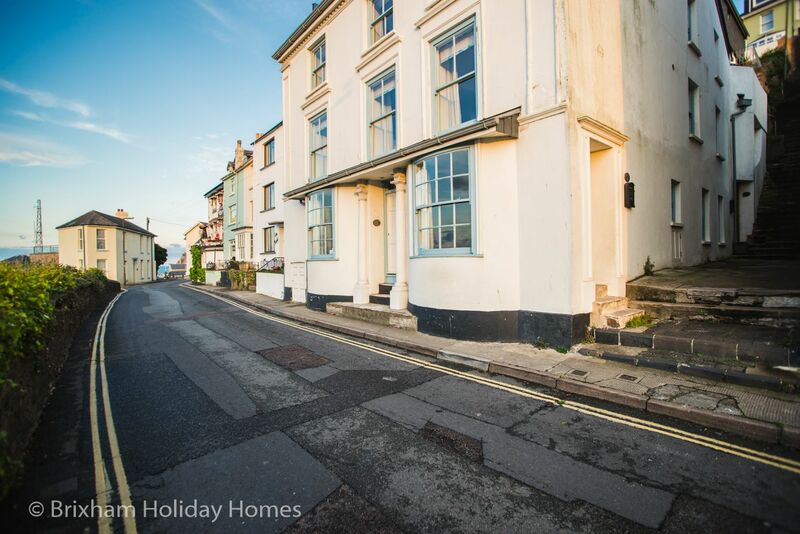 The enviable location on King Street is just a few steps from the harbourside and a minute or so to the town centre. 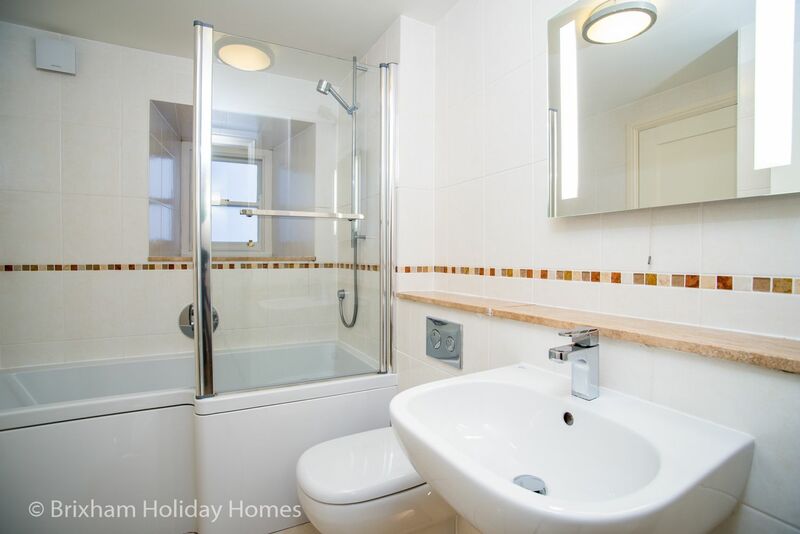 Coral is the sister apartment to Midships, also featured on this site. 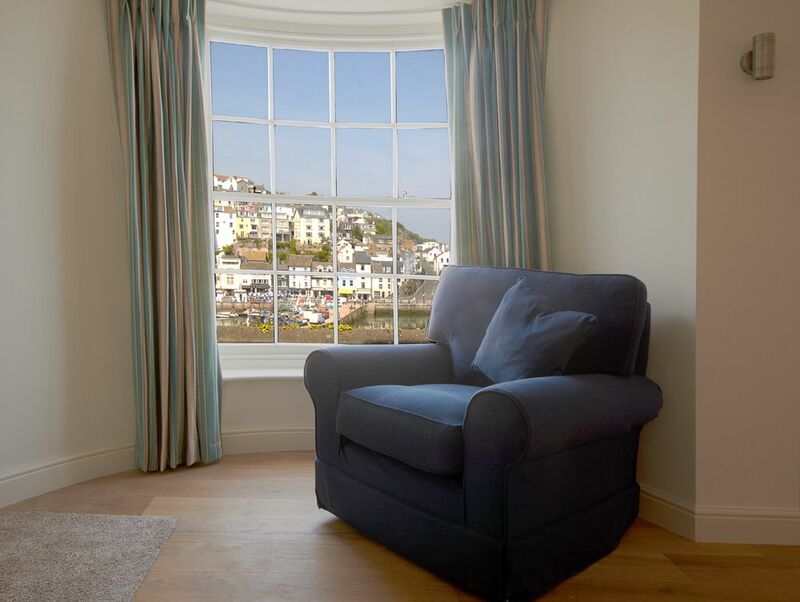 Be captivated by the panoramic harbour and sea views from the 2 large bowed sash windows in the lounge / diner. Coral is so close to the harbour you can almost reach out and touch the water. The apartment has a cool and sleek interior design, with high quality luxury fittings and furnishings from John Lewis and colourful artworks by local artists. Both bedrooms are a good size and feature top quality king size beds, tasteful furnishings, lighting and fully tiled en-suite bathrooms. The master bedroom features an extra large walk in shower and the 2nd bedroom has a ‘Jack & Jill’ style en-suite bathroom with a large bath with shower over. The kitchen features modern appliances by NEFF including a built in dishwasher and is stocked with fine quality crockery, cookware, utensils and glasses. No expense has been spared on the restoration and fit out of this stunning apartment. Private parking space in Ranscombe Road included. Free wi-fi. We know you may have travelled a long way and will want to relax on arrival. You will, therefore, find complimentary tea, coffee, milk & biscuits waiting for you in your apartment, not to mention a bottle of chilled white wine. Welcome Pack includes Tea, Coffee, Milk, Biscuits & a nice bottle of chilled White Wine. 4 steps to a side entrance door. Large lounge and dining area with 2 large bowed sash windows with panoramic harbour & sea views. Coral in King Street, Brixham is a breath of fresh air. The views are magnificent to wake up to each morning and the apartment Has all the amenities you need. Our family had a wonderful Christmas and New Years break in Brixham. Once again we had a brilliant week in the Coral! The location is amazing. The harbour view is always interesting. It's lovely strolling around the inner harbour and a good walk out to the breakwater. Many places to eat and enjoy a relaxing drink. We keep returning. We love it! There really isn't anything to dislike maybe the only thing is a 'little maintenance, some light bulbs need replacing, and skirting lights in one of the bathrooms weren't working. However it wouldn't stop us returning. WE WILL BE BACK! 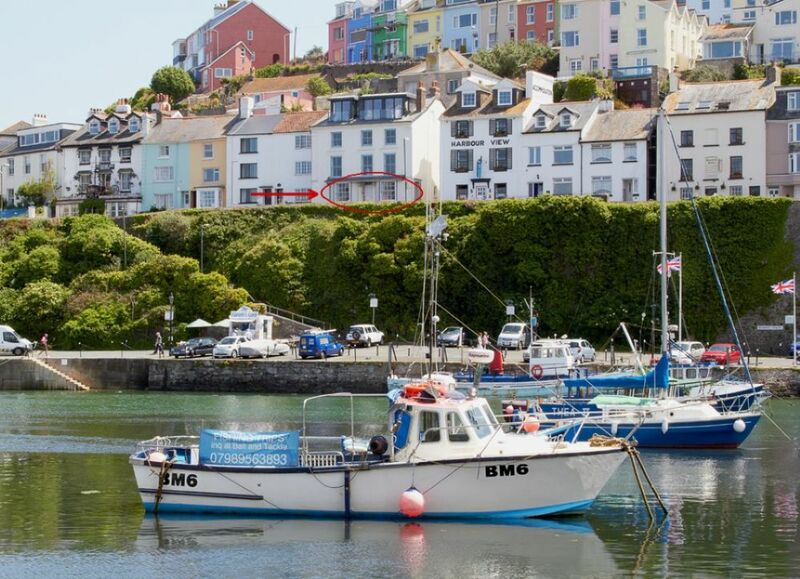 This ground floor luxury holiday apartment is located near the top of King Street overlooking Brixham Harbour. There are 4 steps from the pavement into the apartment. Prime central location just 2 minutes to shops and harbour.